My daughters princess party is coming up in May and I’ve been brainstorming some activities for the kids to do at the party. I finally decided that I would have a craft station where the girls could make Princess Wands and the boys could make Knight Shields. 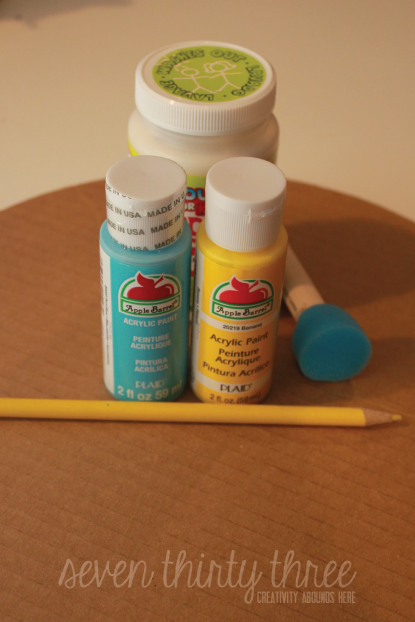 When Plaid Crafts asked me to create a kids craft utilizing Mod Podge Washout and Apple Barrel paints, I knew right away that these two products were perfect for this project! 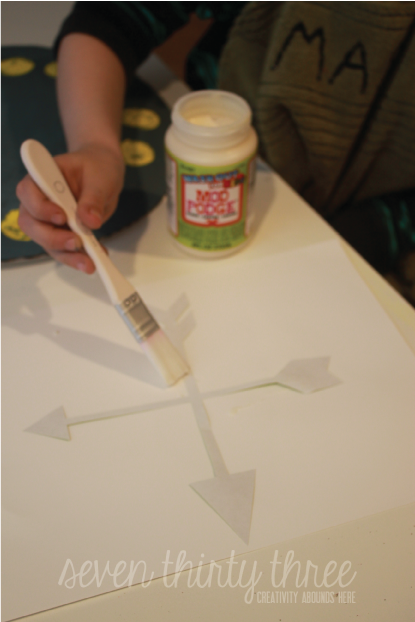 We’ve had the new Mod Podge Washout kid friendly formula in the house since it came out. My kids use it all the time to create collages and other crafts. Both of these products are versatile and easy to clean up with just soap and water. (I also want to note that both are non-toxic and water based – important for kids crafts!). I don’t have to worry about them ruining their clothes or other linens and they get to enjoy using an “adult” item. 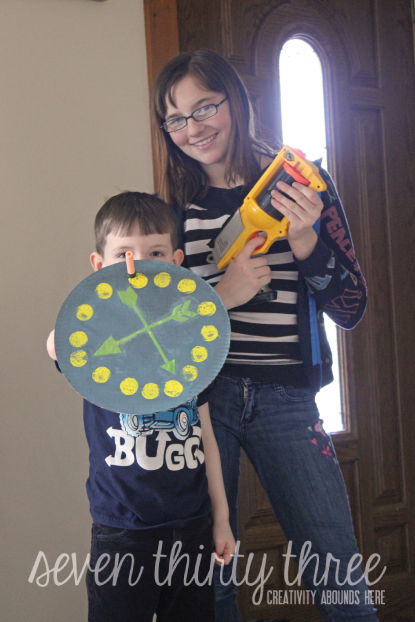 My son and I did a test run to see how the shields would turn out, and he gave them a gold star! 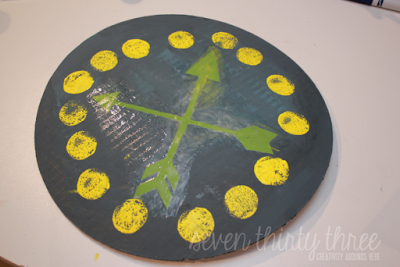 The first step is to paint the shield. Your child can have a ton of fun with this. You can let him just have at it, or if you are going for a more historically accurate shield, look over some examples on the web and draw it out before painting. I was hoping for a nice bright blue shield, but my son had other ideas, so we mixed in some black paint and achieved the gray color he had pictured. Once done, set aside and let the paint dry (or at least that is what you SHOULD do… I was working with an impatient 5 year old, so we moved ahead while the yellow dots were still a little wet). After everything was dry I used hot glue to attach ribbon straps to the back of the shield and then secured them with duct tape. These create the handles that he can fit it arm through. 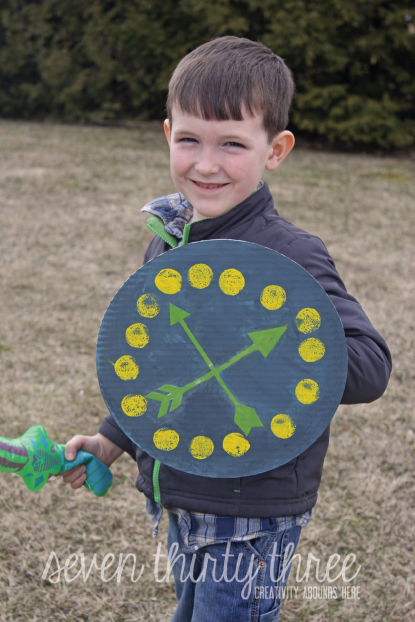 Since it is finally Spring and the snow has melted and the weather is in the 50’s I was able to send the kids outside into the realm of Princesses and Knights where epic battles are fought! This post was written as part of a campaign with The Blueprint Social. All opinions are my own. Kim is a Marketing Manager by day and Crafter/Blogger by night. She lives with her three beautiful children, shih-tzu, Mushu and Goldendoodle, Luna. For even more Inspiration Made Simple, like her on Facebook, Instagram+, or follow along via Twitter! So fun! 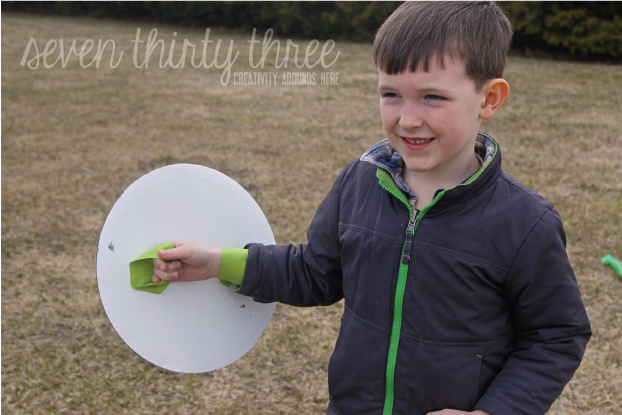 My son makes shields from old cardboard boxes all the time, and I’ve never even thought to just grab some cake cardboard for him so I don’t have to fuss with a utility knife. This turned out so cute! Cute craft, and perfect for a birthday party, too. And wise move on the inflatable swords. 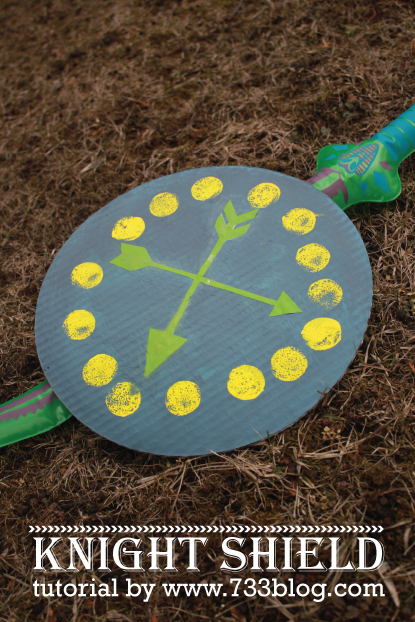 You know boys (and girls) can’t resist play fighting with their swords and shields. This is a great party idea where there is a mix of girls and boys! My Grandson would love that shield! Receive these printable Activity Cubes for free when you subscribe to our weekly newsletter! Prefer to purchase the cubes? Visit the shop now! The images and content of Inspiration Made Simple are protected by copyright laws. DO NOT distribute or copy the content found within this blog without written permission. DO NOT edit or remove watermarks from any image. If you would like to share an image feel free to pick ONE IMAGE only with a direct link to its original post. For questions contact us at Kim@inspirationmadesimple.com. Thank you! 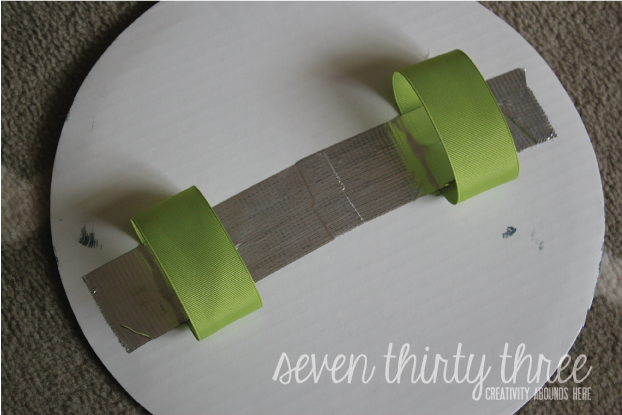 If linking to one of my free printables only link to my blog post, not the printable link. 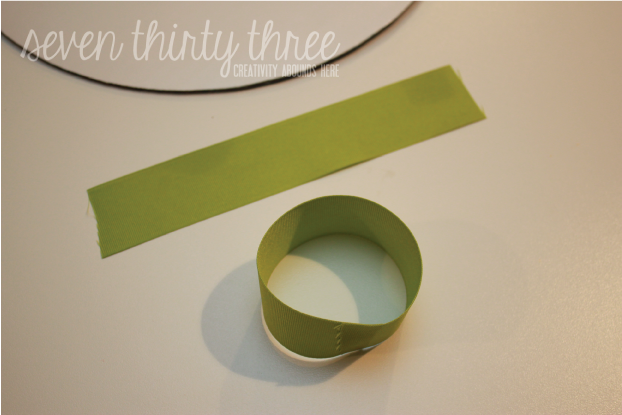 Free printables are for personal use only and may not be altered in any way. Inspiration Made Simple was formerly known as seven thirty three - - - a creative blog. Enter your name and email and get the weekly newsletter PLUS printable Activity Cubes for Kids... all for FREE! Stay up-to-date with all the crafts, DIY projects, recipes, and printables on Inspiration Made Simple! Delivered directly to your inbox every week for FREE!